Is there any pre-course work required? Yes, there is an online theory component for the Manual Handling course and an online component for the Basic Life Support (CPR) course. These online components must be completed prior to attending the practical training session. How early do I need to arrive before a course? You are advised to arrive at least 15 minutes prior to the start time of the session. Please ensure you are familiar with the exact location of your training – and allow time for parking etc so that you arrive on time. What do I need to bring to the practical session? 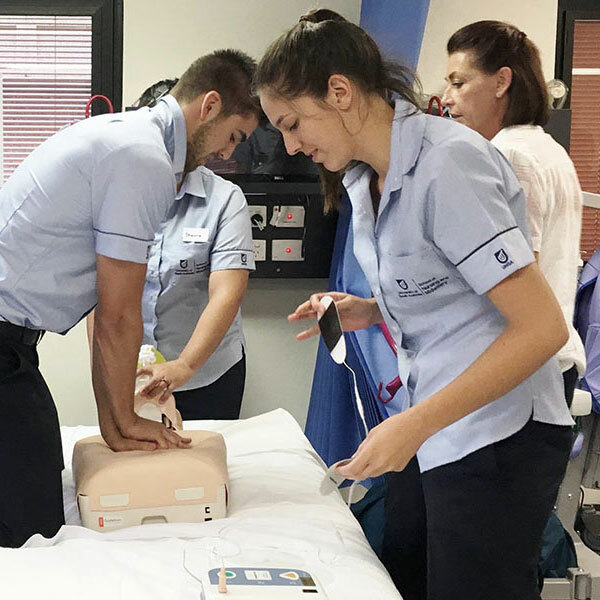 When you complete the online theory component for Manual Handling and Basic Life Support (CPR) you should print the certificate for each and take them with you to your practical training session. These certificates will be stamped by your trainer on the day of your practical training (on successful demonstration of the practical skills required) evidencing your completion of the courses in their entirety. What should I wear to my training session? You are required to wear your full nursing uniform including enclosed shoes. You are not permitted to wear jewellery except for a plain wedding band. First year students who do not have their uniform at the time of their course, may (as an exception) wear practical comfortable clothing (full length pants & T-shirt), and enclosed shoes. Students wearing thongs, shorts, skirts, gym attire or other inappropriate clothing will not be admitted to attend the course and will need to re-book their training which will incur a fee. Are there any exams on the day of the practical session? There are no written exams on the day of your practical session however you will be continually assessed for the duration of the practical session and required to successfully demonstrate the practical components. Are there certificates issued at the end of the training session? There are no additional certificates issued after the practical training. However,upon successful completion of the practical training your trainer will stamp and date the online certificate(s) (the ones you must take to the training with you). The stamped and signed certificates will show that you have completed the courses in their entirety (online and practical). I would like to reschedule my course, how do I do this? Rescheduling your training is allowed 48 hours before the training commences and is strictly subject to there being availability in another training session. An administration fee of $25 applies to reschedule your course. Cancellations may be made more than 48 hours before the training commencing. I’ve lost my certificate(s) can I get a new one? The online theory component is accessible for 6 months after purchase therefore you will have access to the certificates for this period only. Intellilearn do not keep copies of your certificates. You are advised to keep your certificates in a safe place. I am running late for my practical training session, what should I do? All our courses will commence strictly on time therefore students who arrive late for their practical training session (this means any time after the training has commenced) will not be permitted entry into the training session. If you have arrived late a $50 administration fee will be charged to reschedule your session, strictly subject to availability. Please contact the office to reschedule your course. I forgot the date of my course and did not attend. What should I do? Students who do not attend their practical training session will not be entitled to a refund and will not be able to reschedule the course. You will be required to re-purchase the Student+Safe course for the original fee.